Hello everyone! I will be partnering with Hawaiian Tropic for the next few weeks to bring you a fun summer series on the blog. First up? 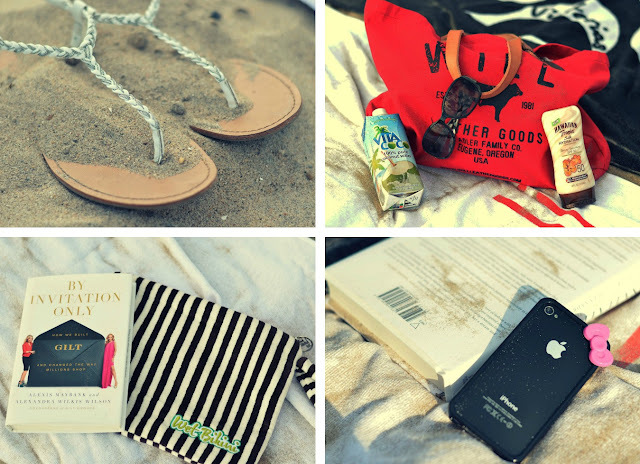 Beach Essentials. The best thing about summer is going to the beach! There’s nothing better than tanning, good company and a few good reads. So, what did I tote with me? Beach Bag Summer is all about color for me. I carried all my essentials in my new Will Leather Goods tote. It is so perfect for the beach or everyday! Cute Sandals I found these babies at the Nine West outlet store while I was in Atlantic City. I’m so obsessed with these because of the metal chain braided into the sandal strap. It’s almost like wearing jewelry on your feet. Hydration I can’t remember when I got so into coconut water, but it’s all I drink. My favorites are the Zico chocolate flavored ones and plain Vita Coco bottles. It’s also great for your skin in the heat. SPF Of course, I’m using Hawaiian Tropic‘s new Silk Hydration lotion. I’m using SPF 50 because I tend to burn quite easily. Honestly, it really is the best sunscreen I’ve used. It smells good and I love that it has moisturizing ribbons swirled in with the lotion. The bottle is actually clear, so you can see the swirl. Book I always cannot find the time to read, except when I’m on the beach. There’s just so much technology and information blasting back and forth everyday that I just lose touch. I brought along one of the most inspiring books I’ve started, By Invitation Only. It’s by the Gilt Groupe founders and if you love being an entrepreneur, I highly recommend it! These ladies are smart. Bikini Bag I always need somewhere to stash my wet bikinis. This one from Henri Bendel is too cute not to bring along. It’s a terry cotton bag lined in plastic, to make sure nothing else in your bag gets wet. I’m also wearing a cute coverup from Victoria’s Secret and aqua bikini from Roxy. I really can’t let go of the mint greens and aqua blues this season. It’s turning into my new favorite colors. My necklace is by Jessica DeCarlo and the cuff is from Forever 21. New Hawaiian Tropic Silk Hydration™ lotion sunscreen is the only sun protection with extra luxurious hydrating ribbons to pamper your skin with 12 hour moisturization. With hydrating ribbons infused with luxurious silk protein and rich shea butter, Hawaiian Tropic Silk Hydration™ sunscreen pampers and protects skin. Available in SPF 12, 30 and 50, Hawaiian Tropic Silk Hydration™ lotion sunscreen provides safe and effective broad spectrum UVA and UVB protection that won’t break down in the sun, along with nourishing antioxidants, exotic island botanicals, a warm tropical fragrance and a lightweight, non-greasy feel. Going to the beach is always fun with a buddy. I went with Jinna and, yessss…. we love to dance in the sand (and document it). Check out her post from the beach outing here. Disclosure: Compensation was provided by Hawaiian Tropic® Sun Care via Glam Media. The opinions expressed herein are those of the author and are not indicative of the opinions or positions of Hawaiian Tropic. Hawaiian Tropic is a trademark of Tanning Research Laboratories, LLC.